Normangee, Texas, is located at Farm Roads 39 and 3 near the junction of the Old San Antonio Road, also part of the El Camino de los Tejas which runs from Mexico to Natchitoches, Louisiana. Most of Normangee lies in Leon County and a small portion lies in Madison County. Normangee is also known as "The Deerest Place in Texas! Membership in National Society Daughters of the American Revolution (NSDAR) is a unique opportunity to establish one's lineage and heritage as a descendent of a patriot of the American Revolution. Applicants interested in participating in the historical, educational, and patriotic activities of the NSDAR are welcome. An individual joins a chapter by invitation of that chapter. She is accepted as a member of the National Society by action of the National Board of Management. A DAR member is first a member of the National Society and through her chapter and state organization she contributes her service to the collective strength and progress of the National Society of the Daughters of the American Revolution. Regular chapter meetings are held on the third Thursday of the month at 1 pm and include a devotional or ritual, a Constitutional moment, and a three-minute National Defense message. Contact us for information about meeting locations and times. The members of Colonel George Dashiell Chapter, DAR, werehonored to present a large framed copy of the classic painting “Prayer at Valley Forge,” by artist Arnold Friberg, to the Leon County Courthouse. This gift was from an anonymous donor, a member of the chapter, and her only wish was that it could be placed where many people could view it. The Leon County Judge Byron Ryder and Commissioners had earlier voted to accept this gift, and they were present at the ceremony. Members of the Chapter participated in the presentation with a short biography of the artist, an overview of George Washington’s leadership of the nation, and included a DAR Dedication Ritual for the event. Following the unveiling, Judge Ryder spoke of the importance of the legacy of George Washington, as our first President, as our Commander in Chief of the Armies, and how many things in our lives have been set in place by this one man. The Chapter is grateful, both to the donor for her generosity, and also to the County Judge and Commissioners, for accepting this painting, and their pleasure to receive such a wonderful gift. In addition, a similar presentation has been made to the Madison County Courthouse, and to the Grimes County Courthouse. The local chapters in each of those counties were invited to participate in this ceremony also (Capt. John McAdams Chapter in Madison, Texas, and Robert Raines in Grimes, Texas). A highlight for Colonel George Dashiell chapter was the presentation of two of its sponsorees were received special awards. The NSDAR Community Service Award was presented to Dan Walrath, and the NSDAR Citizenship Awards went to J. R. Martinez, U.S. Army Retired. 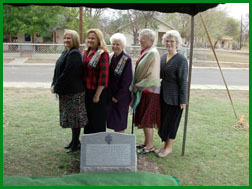 Members shown left to right are Mildred Baur, Jan Reeder, Shirley Bland, Neva Jo Brooks, and Mae Bruce. 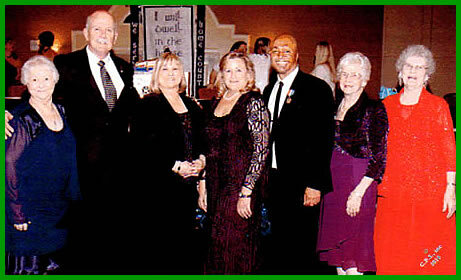 J. R. Martinez went on to National Good Citizens Award at Continental Congress 2015. Chapter Regent and Chapter Registrar works with two prospective members on documentation and application paperwork. 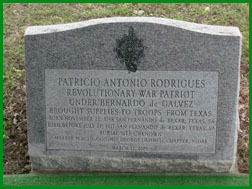 Colonel George Dashiell Chapter sponsored this Revolutionary War patriot grave marker honoring Patricio Antonio Rodrigues. The marker was placed in San Fernando Cemetery #1 in San Antonio, Texas. Chapter members posed during the dedication of a marker honoring Revolutionary War patriot Patricio Antonio Rodrigues.